Conservatives are relying on anti-abortion fearmongering for the 2020 elections. Right-wing media aren’t being subtle about helping that effort. Right-wing media haven’t been subtle about manufacturing controversy over inaccurate characterizations of abortions undertaken later in pregnancy. But the messaging strategy fueling this latest meltdown -- over comments Democratic presidential candidate Beto O’Rourke made about abortion -- is as opportunistic as it is obvious. President Donald Trump has centered anti-abortion fearmongering in his 2020 election messaging, and as this latest outrage demonstrates, right-wing media will continue to be in lockstep. During a March 18 event, O’Rourke was asked  by a staffer from the far-right conspiracy outlet Infowars (which is currently banned  from YouTube and other platforms) whether he supports later abortion access. In particular, the staffer asked  O’Rourke if he would “protect the lives of third-trimester babies because there’s really not a medical necessity for abortion,” echoing inaccurate  right-wing talking points about the necessity of abortions later in pregnancy. O’Rourke responded that he supported abortion access broadly and that it “should be a decision that the woman makes,” adding that he trusted people to make their own decisions. 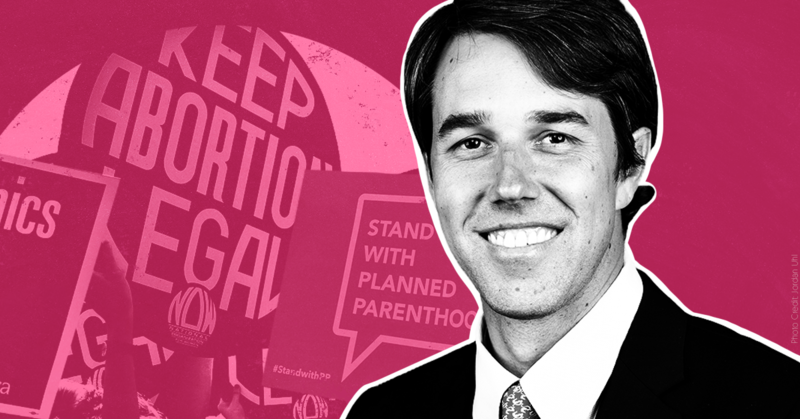 Although innocuous, O’Rourke’s comments sparked an outcry from right-wing and anti-abortion media outlets, which pointed to the moment as the latest example of so-called Democratic extremism on abortion. Cries of Democratic “extremism” have been building  in the right-wing echo chamber since earlier this year, when abortion rights measures in New York and Virginia sparked widespread conservative outrage. Fox News, and right-wing media more broadly, spent weeks whipping  audiences into a frenzy  over various inaccurate depictions  of later abortion -- alleging that Democrats supporting these measures were endorsing “infanticide ” or so-called  abortions “up to birth.” In reality, neither of these  characterizations accurately reflects  abortion procedures or the specific circumstances faced by those patients needing an abortion later in pregnancy. Similarly, although right-wing media often  claim  that supporting abortion rights is harmful for Democrats electorally and that polling supports this allegation, clear  and accurately phrased  polling actually demonstrates the opposite. In particular, support for abortions later in pregnancy increases  when people are given context about the medical or logistical circumstances necessitating later abortions. Nevertheless, Trump and the Republican Party have already adopted right-wing media talking points about abortion as a core part  of their 2020 messaging strategy. Anti-abortion misinformation and allegations of Democratic extremism have transitioned from Fox News fodder , to Trump’s 2019 State of the Union  address, to various speeches  at the 2019 Conservative Political Action Conference, and statements  from White House press secretary Sarah Sanders. Right-wing media and conservative politicians aren’t being subtle about using anti-abortion misinformation as a cudgel to stoke outrage -- because they don’t have to be. Especially when other media outlets have already demonstrated  that they will uncritically parrot  inaccurate framing and talking points borne of the right-wing outrage machine. Anti-abortion fearmongering isn’t going anywhere as coverage around the 2020 election ramps up. Already, conservative media are trying to spark a secondary round  of coverage  over O’Rourke’s comments. It’s only a matter of time before right-wing media gin up another candidate-based controversy to attack abortion access and those who support it, no matter what the consequences  may be.